Puromycin is an aminonucleoside antibiotic produced by Streptomyces alboniger. It specifically inhibits peptidyl transfer on both prokaryotic and eukaryotic ribosomes. This antibiotic inhibits the growth of Gram positive bacteria and various animal and insect cells. 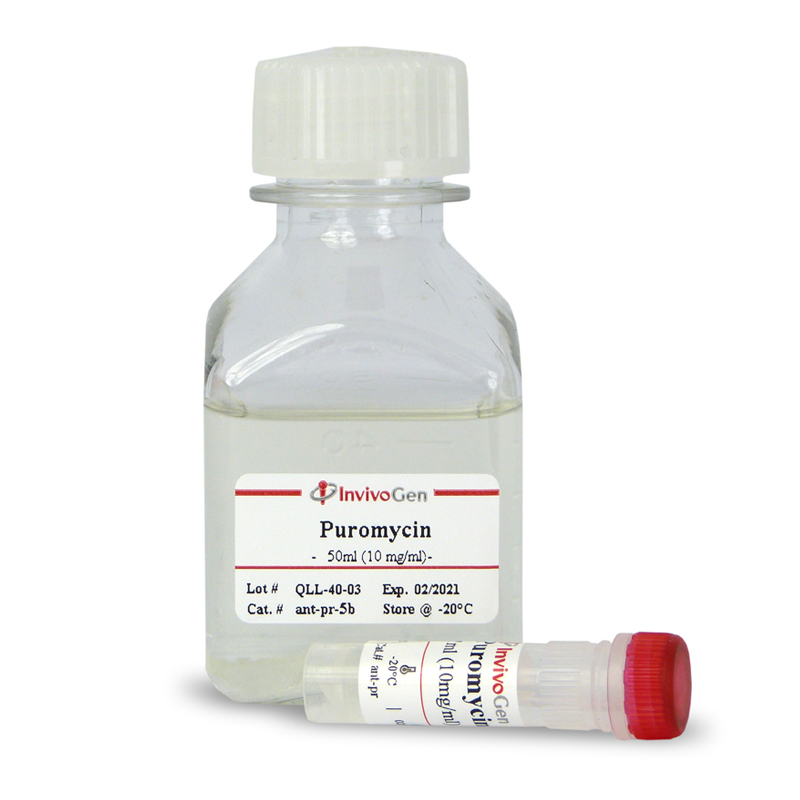 Puromycin can also be used in some particular conditions for the selection of E. coli transformants. Resistance to puromycin is conferred by the Pac gene encoding a puromycin N-acetyl-transferase . Animal cells are generally sensitive to concentrations from 1 to 10 µg/ml. 1. Lacalle R. et al., 1989. Molecular analysis of the pac gene encoding a puromycin N-acetyl transferase from Streptomyces alboniger. Gene. 79:375-80. Puromycin dihydrochloride is supplied as a sterile filtered solution at 10 mg/ml in HEPES buffer. Puromycin is shipped at room temperature. Puromycin is a harmful compound. Refer to safety data sheet for handling instructions. CRISPR-Cas9 Circular Permutants as Programmable Scaffolds for Genome Modification. Patterned human microvascular grafts enable rapid vascularization and increase perfusion in infarcted rat hearts. CRISPR/Cas9-mediated one step bi-allelic change of genomic DNA in iPSCs and human RPE cells in vitro with dual antibiotic selection. The coordinated action of VCP/p97 and GCN2 regulates cancer cell metabolism and proteostasis during nutrient limitation. Dynamics of phosphoinositide conversion in clathrin-mediated endocytic traffic. Ectromelia virus lacking the E3L ortholog is replication-defective and nonpathogenic but does induce protective immunity in a mouse strain susceptible to lethal mousepox. Live-cell measurements of kinase activity in single cells using translocation reporters. Clonal dynamics towards the development of venetoclax resistance in chronic lymphocytic leukemia. Decreased expression of pseudogene PTENP1 promotes malignant behaviours and is associated with the poor survival of patients with HNSCC. Rational design of adjuvants targeting the C-type lectin Mincle. Pathogen-Mediated Inhibition of Anorexia Promotes Host Survival and Transmission. Novel Teleost CD4-Bearing Cell Populations Provide Insights into the Evolutionary Origins and Primordial Roles of CD4+ Lymphocytes and CD4+ Macrophages. Murine GPRC6A Mediates Cellular Responses to L-Amino Acids, but Not Osteocalcin Variants. Rueda P, Harley E, Lu Y, Stewart GD, Fabb S, Diepenhorst N, Cremers B, Rouillon MH, Wehrle I, Geant A, Lamarche G, Leach K, Charman WN, Christopoulos A, Summers RJ, Sexton PM, Langmead CJ. Genetic dissection of Flaviviridae host factors through genome-scale CRISPR screens. Pillay S, Meyer NL, Puschnik AS, Davulcu O, Diep J, Ishikawa Y, Jae LT, Wosen JE, Nagamine CM, Chapman MS, Carette JE. MYC/MIZ1-dependent gene repression inversely coordinates the circadian clock with cell cycle and proliferation. PDK1 and SGK3 contribute to the growth of BRAF-mutant melanomas and are potential therapeutic targets. Scortegagna M, Lau E, Zhang T, Feng Y, Sereduk C, Yin H, De SK, Meeth K, Platt JT, Langdon CG, Halaban R, Pellecchia M, Davies MA, Brown K, Stern DF, Bosenberg M, Ronai ZA. An LXR–NCOA5 gene regulatory complex directs inflammatory crosstalk-dependent repression of macrophage cholesterol efflux. Gillespie MA, Gold ES, Ramsey SA, Podolsky I, Aderem A, Ranish JA. Phosphorylation of GATA-6 is required for vascular smooth muscle cell differentiation after mTORC1 inhibition. Xie Y, Jin Y, Merenick BL, Ding M, Fetalvero KM, Wagner RJ, Mai A, Gleim S, Tucker DF, Birnbaum MJ, Ballif BA, Luciano AK, Sessa WC, Rzucidlo EM, Powell RJ, Hou L, Zhao H, Hwa J, Yu J, Martin KA. 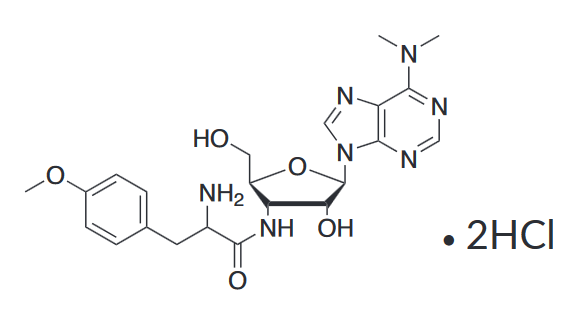 Multiple myeloma-associated hDIS3 mutations cause perturbations in cellular RNA metabolism and suggest hDIS3 PIN domain as a potential drug target. Targeted silencing of the oncogenic transcription factor SOX2 in breast cancer.